What Parents Are Saying About Baby Signing! We are thrilled with the signs our 14 month old son is learning and found your book to be so much better than another book we bought. We especially are keen to teach him signs for emotions. He is picking up signs so fast - yesterday he learned 'apple' after I showed him once. It's really exciting, thanks so much for a great resource. We started signing with Lillian at 7 months, and at 11 months she signed back. By the time she was two she was signing over 20 signs and speaking in complete sentences equivalent to that of most three year olds. It's difficult for me to express the pleasure and joy learning to sign brought us, as our baby was able to communicate her needs and desires happily, easily and clearly without frustration. Her speech development and language skills are also very advanced, I am sure due to signing and the confidence it brings. Lillian is now 3½ years old. We are parents to Jessica, who is now 12 months old. My husband and I both started doing Tinytalk to Jessica when she was 5 months old. At first you wonder if they are really taking any notice of what you are showing them but we soon discovered she definitely was. Jessica did her first sign ('milk') at 7 months; it was soon followed by more signs. She now does five signs and knows the meaning of six other signs too. The enjoyment we get from seeing our baby communicate with us before she can even speak is just amazing. It has helped both of us to know what she wants and makes us feel like we really are meeting her exact needs. We feel so proud of Jessica and eagerly await the next sign she will show us. I had heard only a little about baby sign language, but thanks to Alison's knowledge, I have successfully been able to communicate with our eldest boy Eli for the past 5 months (he's now 15 months) . It would be more appropriate to say that Eli has been able to communicate with us! When we first started to sign, I must admit I was a bit wary as I thought it might inhibit his vocabulary, but much to my amazement he is actually trying to say the word at the same time. We started using the signs 'food' and 'drink'. Eli picked up the sign for 'food' straight away... the sign for 'drink' took a little longer. His favourite sign by far is 'more'. He will sign 'more' for anything whether we are singing a song, playing a game or having a drink. Recently, he's connected two signs together, at mealtime he will sign 'more food', and this has helped us greatly. Previously he would just make a fuss if he wanted more food and I would have to figure out what he wanted. Now he can tell me! Because of the Tinytalk techniques, Eli now tries to say the words as he makes the sign. Thanks Alison, Eli is now looking, pointing to things and waiting for a sign/word to associate them with. He is eager to learn and to show us he understands. I wanted to let you know how we have enjoyed tiny talk since buying your book. James was 6 months when we started signing  we used a few basic signs to start with, and then got into a daily habit of about 6 or 7 signs. He returned the sign for “light” very quickly and gradually pointed out lights that weren’t turned on, street lights and now, at 12 months, lights in books. Last week, on the same day, he returned the sign for food and bath! Just goes to show that as you said, it can take time for baby to take it in, and then all of a sudden he’s got it. It is so wonderful he can tell me when he’s hungry, at 12 months!! His vocabulary is also good  he has about a dozen words that he knows and says. Although the pronunciation is not perfect, we definitely know what he means. Thanks for giving us the chance to give our children an easier start in life. Our second is due in 6-7 weeks, so we will be able to start signing earlier. The beauty of it is that the kids will be able to talk to one another also. We started signing to our baby Chloe from 1 month; we thought the earlier the better. We began with milk and bath as these were the only activities she really took part in. At three months she signed milk while crying after waking up. Since then we have introduced walk, nappy change and food, Chloe knows what the signs mean but may take a little longer to sign back regularly. Just lately we think she is trying to sign bath and walk. It is a fantastic program, Chloe knows what we are saying and by using the milk sign it has stopped a few crying matches straight after she has woken up. We look forward to introducing new signs when she is a couple of months older. I received the tiny talk book as a present from my sister. I started doing the baby sign about 5-6 months ago. My little boy, Fletcher is now 14 months and his sign has just taken off it probably took about a month or two for him to start but once he did he just kept going. It really is amazing everyone I see and tell think it is just great. They really think he is very clever. He can now do about 17 signs including frog, fish, dog, rain, milk, food/hungry, toast, gone, shoes, hat, light, fan, duck, giraffe, tiger, monkey, clouds. He is nearly doing a new sign every day. It really is wonderful. I am so glad that I have taken the time to teach him both from an educational and every day communication perspective. I am very happy to say that my 16 month old Brodie uses about 6 signs, and a few variations of her own. My four year old Emma has been copying me and also signs to her sister. Brodie doesn't have any words yet so we are both enjoying being able to communicate a bit. As it happens I said to my husband yesterday "you were skeptical about sign language but look at us now" and he agreed that it was definitely helpful and learnable for her. Some of my friends have been quite surprised too. 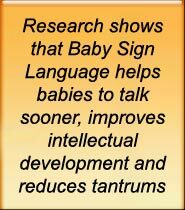 It did take a while for her so start, but I persevered as I taught Emma a couple of signs as a baby that I read in another book, although she spoke early and we didn't really have the need. Thanks for a great product and I wish you every success. I am enjoying being able to sign to my little one...I actually started using this when she was just on Three months old. (If not for her - practice time for me) By five and half - six months she new the sign for milk and for up and would get very excited by me showing her the signs and then being able to give her what they meant. She is now 9 months old and has been signing both milk and up back to me she is learning eat, she understands it but hasn't signed back to me, she is also learning more, please / thank you, come (as she is starting to crawl this is a good one) bath and gentle....Not all at once but as the need and conversation arises. In the beginning I especially found the single hand signs easy to do as she was always being held by me, now that she is a bit more independent the two handed signs are getting a work out. She has always been fascinated by hands, and would lie in her cot and play with hers for hours, now she watches mine just as intently.